any of a class of organic compounds with the general formula R-OH, where R represents an alkyl group made up of carbon and hydrogen in various proportions and -OH represents one or more hydroxyl groups. any one of a group of organic compounds with general formula RCO2R′ (where R and R′ are alkyl groups or aryl groups) that are formed by the reaction between an alcohol and an acid. ..... Click the link for more information. ; and in medicine. It has many other uses as well. (1,2,3-trihydroxypropane; 1,2,3-propanetriol), the simplest trihydric alcohol HOCH2—CHOH—CH2OH; a syrupy, colorless, nontoxic, sweet, odorless liquid. Melting point, 17.9° C; boiling point, 290° C; density, 1.26 g/cm3(25° C). Upon supercooling, it forms a glassy mass at about -100° C. Glycerol may be distilled without decomposition only under vacuum or with superheated steam. It is miscible with water in all proportions (the boiling point of aqueous glycerol solutions decreases with decreasing glycerol concentration; these solutions are characterized by low freezing points), as well as with methanol, ethanol, and acetone. It is soluble in mixtures of alcohol with ether or chloroform but is insoluble in fats, petroleum ether, benzene, and carbon disulfide. It dissolves many inorganic and organic materials, such as salts, alkalies, and sugars; it is hygroscopic and absorbs water from the air up to 40 percent (by weight). Glycerol forms mono-, di-, and tri-derivatives. Like other alcohols, it forms metallic derivatives—glycerates. On reacting with hydrogen halides or phosphorus halides, halohydrins are formed—for example, α-chlorohydrin, C1CH2CHOHCH2OH, and α, γ-dichloro-hydrin, ClCH2CHOHCH2Cl. Glycerol oxidizes to glyceraldehyde (CH2OH—CHOH—CH=O), dihydroxyacetone (CH2OH—CO—CH2OH), and glyceric acid (CH2OH— CHOH—COOH), as well as CO2 and water. The dehydration of glycerol leads to the formation of polyglycerols or acrolein. Glycerol reacts with aldehydes and ketones to give the corresponding acetals and ketals (for example, acetaldehyde-glycerol acetal and acetone-glycerol ketal). Reaction with mineral acids gives esters—for example, the treatment of glycerol with a mixture of nitric and sulfuric acids yields glycerol trinitrate, so-called nitroglycerin. Acylation with organic acids, or with their derivatives gives mono-, di-, and triglycerides. The triglycerides of higher fatty acids comprise the main part of fats and oils of vegetable and animal origin. 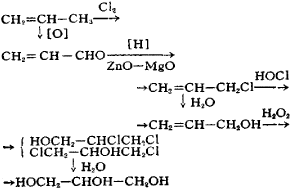 Other methods for the synthesis of glycerol are also known. Glycerol is used in the production of explosives and synthetic resins. Epichlorohydrin, which is produced from glycerol or from the intermediates in its synthesis, is the raw material for the production of epoxy resins. Glycerol is an important component of many food, cosmetic, and pharmaceutical products. It is used in the printing, leather, textile, and paper industries. Aqueous solutions of glycerol are used as antifreezes. In medicine, glycerol is used locally as a skin softener, as well as in suppositories and enemas as a laxative. It serves as a base for the preparation of ointments and liniments. Glycerol derivatives, such as fats and lipids, play an important biological role. CH2OHCHOHCH2OH The simplest trihedric alcohol; when pure, it is a colorless, odorless, viscous liquid with a sweet taste; it is completely soluble in water and alcohol but only partially soluble in common solvents such as ether and ethyl acetate; used in manufacture of alkyd resins, explosives, antifreezes, medicines, inks, perfumes, cosmetics, soaps, and finishes. Also known as glycerin; Also known as glycerin; glycerine; glycyl alcohol. glycyl alcohol. Colorless, odorless fluid used in mixing synthetic and natural resins for paints and varnishes; used for making distempers more pliable; used in the manufacture of some adhesives.